AnonVPN Review 2018 – Should You Use Anon-VPN? Anon-VPN is a new offering in the market of Best VPN services. Created by a small team of developers, the main aim of the service is to promote online privacy and anonymity.It boasts some great encryption features, a no logs policy, and SmartDNS. However, there are certain warning signals to using the VPN, as it has weak privacy and no legal policy pages. Are you planning to use the VPN? Look at this detailed AnonVPN review to ease the decision-making process. Anon-VPN offers just one plan to all its customers, divided into monthly, quarterly, semi-annual, and yearly payment options. 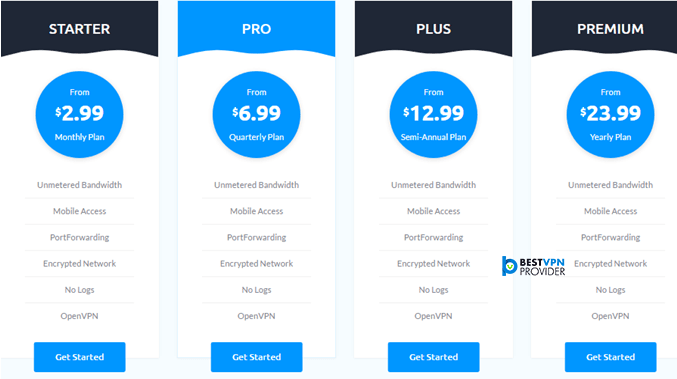 The Starter (monthly) plan is available for a low price of $2.99, which is a good option for first-time VPN users not looking to spend too much on a VPN service. The Pro (quarterly) plan is just as budget-friendly. Priced at $6.99, you leverage safe and secure browsing for 3 months. If you want to use the VPN service for an extended period, you can leverage the low rates of the plus (semi-annual) and Premium (annual) plans. Once you choose a plan that best suits your budget requirements, you will gain anonymous access wherever you want, whenever you want. Users can also take advantage of fast downloading, video streaming, and unmetered bandwidth. *Anon-VPN does not offer a free trial. This means, you do not have to watch out for any weird catches. Cancellation is easy. No explanation is required. However, we did not find an exact payback period if you want get a full refund during our AnonVPN review, which was surprising. Anon-VPN accepts over 38 payment methods, which include credit/debit cards (Maestro, Visa, MasterCard and Discover) and e-wallets (Skrill, PayPal, and PayU). However, our AnonVPN review establishesif you want to remain as anonymous as possible, it is better to purchase a plan with Bitcoins. Since Anon-VPN is a growing VPN service with a limited customer base, it does not offer lifetime deals to new and prospective clients. However, there are other amazing lifetime deals for VPN access and online security from other more reputable service providers, like PureVPN and ExpressVPN. Using a VPN when connected to the internet will hide your personal IP address and assign you one based on the server you use. Our AnonVPN review found that the service has servers in nine locations, which is not bad considering how low the pricing is. As a relatively new offering, our Anon-VPN review revealed that the service has a small user-base. This means, customers will be able to leverage good performance on most servers.Thanks to lesser traffic, you can expect good download, and streaming and page load speeds. Anon-VPN does not keep any connection/metadata logs. It permits P2P BitTorrenting for users, as the service believes in “Open Internet”. You can use the service on all types of devices (laptops, computers, and smartphones), but not at the same time. According to our AnonVPN review, all the servers offered by the service operate on Gigabit Lines. Thanks to the GBIT network, you can enjoy seamless browsing and smooth streaming, regardless of which plan you choose. You even have multiple connection protocols available to makebrowsing safer and secure. In our AnonVPN review, we found that all serversof the VPN service are preconfigured to use SmartDNS. This technology proves useful in geo-spoofing your location for accessing streaming services, like BBC iPlayer and US Netflix. It also helps in blocking over 100,000 ad-serving domains. This puts an end to those extremely annoying ads and intrusive popups, while reducing cellular data usage. By resolving your DNS requests at a specified location, the SmartDNS even reduces buffering issues (as no encryption/decryption is required). Since the only thing that changes is your DNS, this feature from Anon-VPN is secure from websites/services that try banning VPN users. However, SmartDNS does not have an effect on your safety or privacy, as it does not feature encryption. This means, your IP is still traceable back to you. 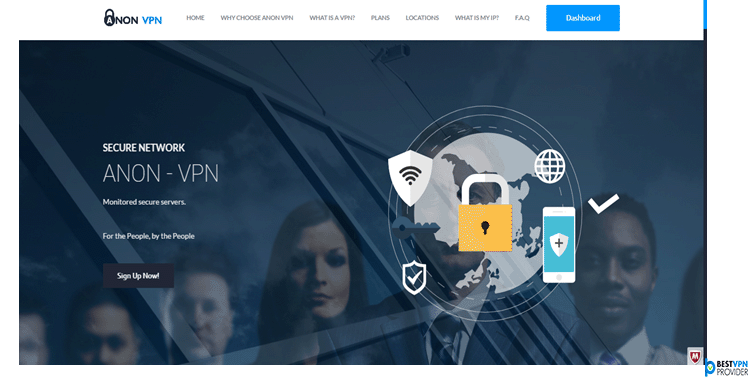 At first glance, our AnonVPN review reveals the website boasts a neat layout and straightforward design. You will not find any useless clutter/content, giving off a reliable and attractive appeal.The top navigation even has quick links to the FAQ, Server Locations, Plans, Contact, and Customer Dashboard. If you create an account, you will have no knowledge about the uncomfortable conditions listed by the website (a risky proposition). That said, according to our AnonVPN review much of the website is a hit and miss case with inconsistent and unhelpful information. The unavailability of a designated search tool also makes it difficult to find what you are looking for. Anon-VPN tries its best to incorporate some of the best security measures and protocols. You have the capability of choosing from OpenVPN, IPSec, PPTP, and L2TP protocols for browsing the internet with complete anonymity. Privacy is excellent and the service does not record any sorts of logs. There is no doubt VPN services have become a vital tool for countering the growing threats of internet surveillance. However, not all VPN service providers focus strictly on anonymity as one might hope. Some VPN services log user location, addresses, contact data, IP-addresses and other private info. Using Anon-VPN, on the other hand, boosts your safety. The service does not keep any sorts of logs, which means you leverage the utmost level of anonymity.This saves you from the prying eyes of governmental agencies/aggressive marketing firms, allowing you to enjoy a completely untraceable internet experience. In our AnonVPN review, we found the service offering almost all VPN protocols including PPTP, L2TP, IPSec, and OpenVPN (TCD and UDP). This presents you plenty of options for connecting to a secure and encrypted network, while enjoying good speeds.Individual users will find good capability with the PPTP as it delivers fast performance. However, for large offices or ones with tougher security requirements, the L2TP/IPSec and OpenVPN protocols offer better security and anonymity. With copyright pirates keeping a strict eye on torrenting sites, the vulnerability of torrent downloaders getting tracked and penalized is increasing. Without the protection of a VPN, it is easy for anyone to track your IP address. Lucky for you, Anon-VPN believes in “Open Internet”. The VPN service provider earlier permitted P2P/torrenting on all locations except for UK servers and US. However, we received an email stating that the service has been getting quite a lot of copyright infringement warnings on some of its servers. In efforts of countering this issue, AnonVPN has restricted P2P/Torrenting to Swedish and Russian servers only. Since Anon-VPN states that it does not keep any logs, you do receive added security and anonymity for torrenting. However, incompliance to this new change may result in losing access to their services. Our AnonVPN review shows that the service does not have a very active or reliable Support Team. Although the site does not make claims to offer 24/7 support, it is uncanny to expect anything less. Live chat and phone support is missing. The site has not listed any contact number on the main page. The support page (displayed above) does not contain any information to help customers. A blog section is present, but just like other links – it is completely blank. You can submit a ticket to seek help from support specialists (if they reply). 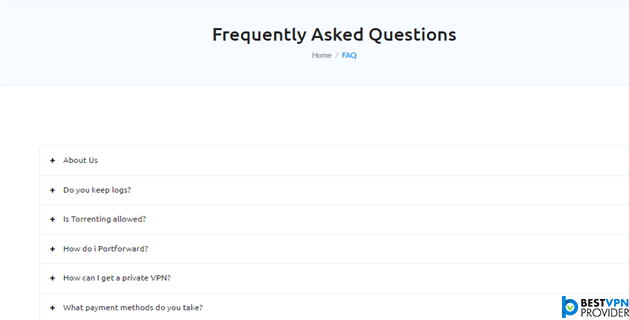 The only source of help you have is the FAQ section that has a limited six questions with incompletely written answers. According to our AnonVPN review, there is not much information present on the website regarding the platforms the service supports (apart from a Windows client). Anon-VPN offers flash routers for expanding VPN protection over your entire network. Whether connecting to a Chromecast, Roku, AppleTV, PS4, or Xbox, a flash router can offer you added encryption, along with an array of business-class monitoring and security features. Using open-source router firmware’s like Tomato USB & DD-WRT, flash routers from Anon-VPN remove potential backdoors and faulty manufacturer firmware. This gives you complete control of your online activity, while boosting privacy and security. Our AnonVPN review found that the service does not offer a dedicated app for Android users. You will be required to configure the VPN manuallyto use it on your smartphone. Android has integrated L2TP and PPTP protocols, so you can easily connect to an Anon-VPN sever within no time. You can do this by opening the settings app, tapping “More” under Wireless & Networks, and selecting the VPN option. 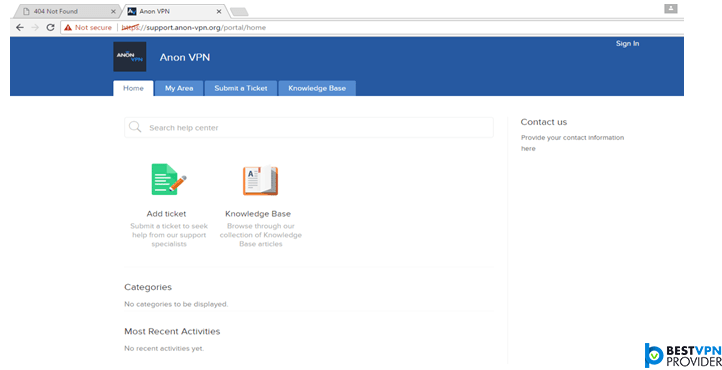 In the configuration menu, enter Anon-VPN in the name field, the type of server you are connecting to, and the server address. AnonVPN does mention that it offers dedicated IP servers on its website. However, the claim lacks the backing of relevant information and links. If you are searching for dedicated IP, we would suggest other alternatives. You can check out our tested dedicated IP VPN providers and select the service that meets your needs. Anon-VPN is a good choice for novice VPN users, as its pricing is reasonable, security is good, and users can activate P2P Torrenting. 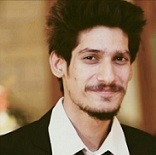 However, the nonexistent customer support may become a drastic problem, as it becomes difficult to find solutions to problems faced while connecting to an Anon-VPN server.